Jerusalem was the stage for many significant episodes in the ministry of Jesus as recorded in the New Testament Bible. Two of His most memorable miracles occurred at pools in the neighbourhoods of Bethesda and Siloam. According to the Gospel of John, at the Pool of Siloam Jesus healed a lame man, while at Bethesda He healed a blind man. And visitors to Jerusalem seeking its genuine religious sites are interested to know if what is purported to be the pools, are in fact the historical locations. So what is the archaeological and historical evidence that these places mentioned in the Gospels were real. 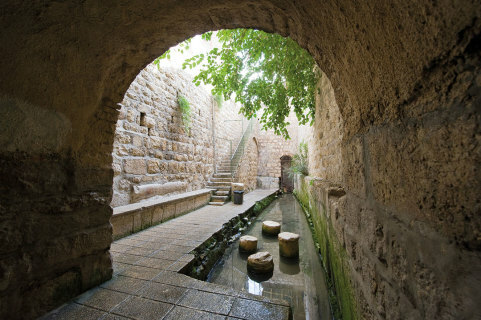 The Pool of Bethesda was the site of Christ’s first miracle of healing (see John 5:2–9). The exact name and its meaning has been the subject of discussion, since manuscripts of the Gospel of John from antiquity variously render the name as “Bethesda,” “Bethzatha” and “Bethsaida.” Although the Codex Sinaiticus renders the place name as “Bethzatha,” and Codex Vaticanus and a few others record the name as “Bethsaida,” the majority of ancient manuscripts preserve the name as “Bethesda.” Further, other first century AD texts, such as the Copper Scroll from Qumran and the writings of Josephus, also attest to the Bethesda reading and demonstrate that Bethesda was the name of the pool and a particular neighbourhood in Jerusalem. Bethesda is thought to mean “house of mercy.” The Gospel of John (5:2) notes that it was a Hebrew place name. The story states that “there is in Jerusalem” the Pool of Bethesda and then adds another architectural clue, which most translations render as “sheep gate.” This is helpful in determining the precise location. While there is no word “gate” in the original Greek text of John, sources from antiquity do mention the pool or the sheep pool. The biblical book of Nehemiah refers to a sheep gate being built in Jerusalem in the fifth century bc, and it may have even been in the area that the Pool of Bethesda was eventually built, but all available evidence suggests that John was referring to a pool and not a gate. Besides the name and general location, the text of John gives additional details about the pool which are useful in its identification, such as a connection with sheep, the distinct architectural design of five porticoes or stoas, use as a pool for bathing or washing, and an association with healing (John 5:2–7). Pool of Bethesda Western steps The Gospel of John describes the Bethesda Pool as having five porticoes—a puzzling feature suggesting an unusual five-sided pool, which most scholars thus dismissed as an unhistorical literary creation. Yet when this site was excavated, it revealed a rectangular pool with two basins separated by a wall—thus a five-sided pool—each side having a portico. Eusebius, writing in the fourth century, mentions the “sheep pool” not the sheep gate, and he identified it as a place of twin pools (Eusebius, Onomasticon). The Bordeaux Pilgrim in the early fourth century calls them twin pools but mentions no gate, while other writings of the fourth and fifth centuries also mention the site of the pool, demonstrating that the ruins of the pool were visited during the Late Roman and Byzantine periods (Itinerarium Burdigalense; Cyril of Jerusalem; Jerome). Josephus, in the late first century ad, mentions the area of Bethesda, and notes that this neighbourhood was north of the Antonia Fortress with a small valley in between, in an area of Jerusalem that became walled at the time of Herod Agrippa around 41–44 AD (Josephus, Wars). Therefore, at the time of Jesus, the Bethesda neighbourhood was just north of the city walls, but about a decade later that area of Jerusalem became encapsulated by the third wall. 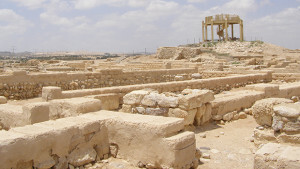 However, the location of the Pool of Bethesda appears to have been lost by the seventh century after the Arab conquest, and only rediscovered through archaeological investigation at the end of the nineteenth century, when a site was identified and excavated adjacent to St Anne’s Church in Jerusalem, north of the Temple Mount. The pool was constructed in the eighth century bc, probably during the reign of King Hezekiah, and an upper pool in the area of Bethesda seems to be the one mentioned in the Hebrew Bible (2 Kings 18:17; Isaiah 36:2). Around 200 bc, during the time of the Seleucid Empire, it appears that an extension of the original pool was built, essentially making a pair of pools, an upper and a lower division of one large pool. This pool system may have been constructed in order to collect water for the washing of the sacrificial sheep, as the temple was located just to the south of the pool. The association with the washing of the sacrificial sheep could also be the origin of the sheep pool references. The western side of the southern or lower pool had rows of plastered stone steps that allowed easy entry into the pool, along with multiple landings. 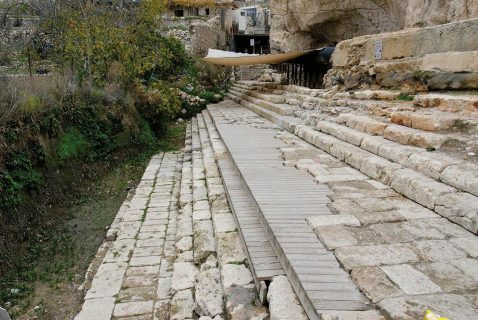 The landings and steps for entry into the pool and the configuration of an upper reservoir and lower pool functioning as a ritual bathing pool were features extremely similar to the Pool of Siloam, except that Siloam was fed by the Gihon Spring while the water supply at Bethesda was provided by rain. Archaeological investigation also clarified the odd description in the text of John describing a pool with five porticoes and demonstrated the accuracy of the architectural description. Excavations revealed a rectangular-shaped pool bounded by porticoes on all four sides. The Crusaders Chapel The basilica that covered the Bethesda Pool was destroyed by the Persians in AD 614 and its masonry ended up in the pool. Over part of the ruined basilica, the Crusaders built the Church of the Paralytic. Its façade, main entrance and apse can be seen standing high over the pools, an example of the practice of building one church atop another. The fourth century church leader in Jerusalem, Cyril, must have been aware of the architecture at the ruins of the pool before a church was built over the site, as he correctly noted the arrangement of the five porticoes to be surrounding the pool on four sides, with the fifth portico part of the division between the upper and lower sections. In the first century ad, the apostle John refers to each of the pools of Bethesda and Siloam as a kolumbethra, or pool of water that could be used for bathing or washing. Therefore, it seems to have been used for ritual washing and healing by the first century ad, rather than its older function for washing sacrificial sheep. If the pool had formerly been used for washing of the sacrificial sheep, but by the time of Jesus was instead used for ritual washing, then the description in John as “upon the sheep pool” is another pool with five porticoes is understandable, since the new ritual washing pool seems to have been built over the older sheep pool. This idea is suggested in the Copper Scroll found at Qumran, dating to around 25–70 ad, which mentions the Pool of Bethesda and indicates that people used the smaller section for ritual washing. Although pools had existed at this location previously, the Bethesda pools of the time of Jesus were probably built relatively recently, around 25 bc. Therefore, in the time of Jesus, the Pool of Bethesda, with upper and lower sections divided by a sluice gate and decorated with five porticoes, functioned primarily as a rainwater-fed bath system and qualified under the rules of Judaism as a ritual purification pool. The story at the Pool of Bethesda also makes it clear that there was a healing tradition associated with the pool. 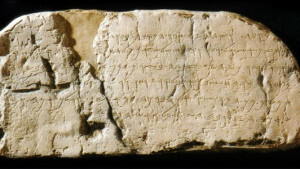 Although a few ancient copies of John omit a section in verses three and four, this is found in the vast majority of ancient Greek manuscripts and most of the earliest translations, including texts of second century church fathers, suggesting that the section was probably present in the original text of the Gospel of John. Memories of the healing miracle of the man who was ill for 38 years persisted for decades after Jesus, because during the reign of Hadrian in the early second century, the emperor had a shrine to Asclepius, the Greek god of healing and medicine, built at the southeast side of the pools as part of a campaign to defile or erase sites associated with Jesus and Christianity. During archaeological excavations, a foot with a dedicatory inscription to Asclepius, as thanks for curing a disease, was discovered above the pool. Then in the fifth century during the time of Bishop Juvenal of Jerusalem, a Byzantine church was built at the pool to commemorate the healing miracle that Jesus performed. 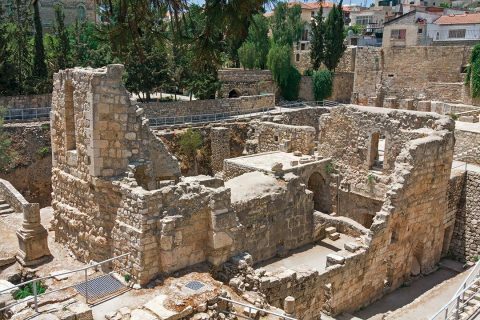 This church is also found on the Madaba Map of the middle of the sixth century ad, and the ruins of the church can still be seen today alongside the remains of the Pool of Bethesda. Traditional site of the pool of Siloam The water from Hezekiah’s Tunnel exits into this pool, traditionally believed to be Siloam. The column bases were once part of a Byzantine church constructed by Empress Eudocia to commemorate the miracle recounted in the New Testament. 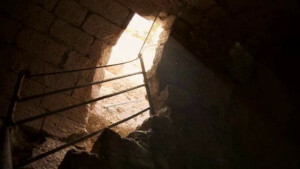 However, the exact location of the original pool as it existed during the time of Jesus remained a mystery until 2004. The Pool of Siloam relates to the healing of the blind man in which Jesus placed clay on the eyes of a man, then instructs him to wash in the Pool of Siloam, after which he returned with sight restored (John 9:1–11). The name “Siloam,” from the Hebrew verb shalach, means “sent” (John 9:7). Like Bethesda, the name apparently designated a neighbourhood of ancient Jerusalem, and it is mentioned in the books of Isaiah (8:6), Nehemiah (3:15), Luke (13:4) and John (9:7). While the English translation of the name may vary by book as Shiloah/Shelah/Siloam, all of the renderings come from the same ancient Hebrew name. The Pool of Bethesda was located in northeast Jerusalem, just outside the walls during the time of Jesus and immediately north of the temple complex, while the Pool of Siloam was located on the opposite side of the city, near the southeast corner but within the walls of Jerusalem. Josephus placed the Pool of Siloam in southeast Jerusalem near the turning point of the wall, and his writing served as an important reference from antiquity for correctly locating the remains of the pool (Josephus, Wars, 5.140–145). Ancient sources indicate that the Pool of Siloam was in use during the time of Jesus and Josephus, but that it was eventually covered over after the destruction of Jerusalem in AD 70 and “lost” to history for centuries. The area of the Pool of Siloam was at the low corner of southeast Jerusalem, down the slope from the rest of the city, which rises to the north and the west. Because of this, deposits of debris, mud and dust from the rains, winds and destruction of the city would have covered the area relatively quickly. 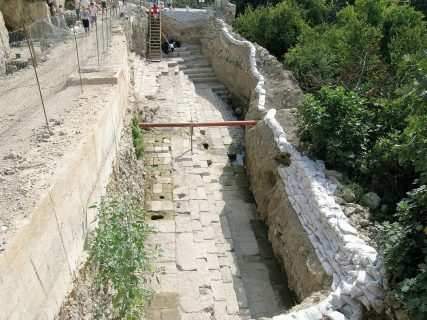 Archaeological excavations in the neighbourhood of Siloam demonstrate that an upper pool was originally constructed in the time of King Hezekiah in the eighth century bc, apparently in conjunction with the carving of an approximately 533 m-long (1750 ft) water tunnel. Hezekiah’s Tunnel deposited water into this pool system from the Gihon Spring (2 Kings 20:20; Isaiah 22:9). In 587 bc, the Babylonians destroyed Jerusalem, including the area of Siloam. Just after 444 bc, Nehemiah led the returned captives in rebuilding the walls of Jerusalem, as well as a pool in the neighbourhood of Siloam (Nehemiah 3:15). This upper Pool of Hezekiah came to be traditionally considered the Pool of Siloam at least as early as the fifth century ad, when the Byzantine empress Aelia Eudocia commissioned a church to be built there to commemorate the miracle of Jesus. This church was destroyed by the Persians in 614 AD, but ruins of the church indicated to archaeologists that the Pool of Siloam of the time of Jesus had been located there, since in most places Byzantine churches correctly marked the locations at significant events in the life of Jesus, relatively recent history at the time. Archaeology has revealed remains from the second and third centuries AD at this upper pool under the Byzantine ruins, but no material was found from the first century, indicating that the site had been incorrectly identified as the first century Pool of Siloam. The lower pool of Siloam was rediscovered in 2014 during repair work on the contemporary sewer system. The discovery of coins and pottery indicates this pool was in use in the first century ad. This dating makes the site a more likely location for the biblical account of a blind man being directed by Jesus to wash mud from his eyes in the Pool of Siloam in order to receive his sight. In this case, the confusion was probably a result of the covering of the lower pool after the destruction of Jerusalem. A few scholars thought the Pool of Siloam mentioned in the Gospel of John was slightly southeast of the “upper pool” of Hezekiah due to geographical analysis and descriptions in Josephus, but that it had become covered by the destruction of the city and the ravages of time. Then, in 2004, about 60 metres (200 ft) southeast of the upper pool, the lower Pool of Siloam was rediscovered by accident during repair work on the contemporary sewer system. The existence of this pool had been hypothesised previously, and a few scholars suggested it as the first century Pool of Siloam, but it had not been exposed since antiquity. While only partially excavated, it is likely that the entire pool is relatively intact due to the rapid covering after 70 AD that provided protection to the structure. The Pool of Siloam was approximately 70 metres (230 ft) long, with widths of about 40 metres (130 ft) and 60 metres (197 ft), roughly rectangular in shape like the Pool of Bethesda, although the corners measuring slightly over 90 degrees and different widths mean it is more aptly described as a trapezoid. The stones used in construction are local white limestone, and these were cut in precise rectangular blocks. Excavations have revealed a design of three sets of five steps leading into the pool, with an open area just above the lowest set of steps, which may have been built to accommodate varying water levels. The rest of the pool has yet to be excavated, as most of the land above the pool is covered by an orchard, which the Greek Orthodox Church identifies as the King’s Garden (Nehemiah 3:15), and has not yet given permission to excavate. In the soil in one corner of the pool, at least 12 coins have been found from both the time of Alexander Jannaeus (ca. 104–76 BC) and the first Judean Revolt against Rome (ca. AD 66–70), with the latest coin bearing the quote “4 years to the day of the Great Revolt,” indicating AD 69 as the year of minting. Construction workers building the pool placed four coins minted by Alexander Jannaeus in the original plastered steps, which were later overlaid with stone in the remodelling of the pool, which probably occurred either in the time of Herod the Great or Herod Agrippa I. Pottery of the first century was also discovered in excavations of the pool. Obviously the coins demonstrate that the lower pool was in use from at least the first century BC until the fall of Jerusalem in AD 70, indicating that the pool had begun to be filled in at the time of the Roman destruction or soon after. Earlier remains under the stone steps suggest that it had first been built in the time of the Hasmoneans and then remodelled. Pool of siloam steps One side of the pool has been excavated so far, revealing three sets of five stairs along its entire length, each leading down from the street level into the pool. The presence of steps leading into the water basin is an identifying feature of a miqveh. From the upper pool, a channel ran to the lower pool, where the water was held in what seems to have been a ritual washing pool in the first century ad. As the Gihon Spring was the source of water for the pool, it would have been an obvious choice for ritual washing due to the “living water” that flowed into it. 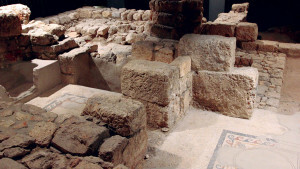 While the Siloam pool was supplied by a spring and the Bethesda pool by rainwater, both the stone water containment systems qualified under the Law as eligible for use in ritual purification (Leviticus 11:36; 15:13). The extensive size of the pool, like Bethesda, has led many to suggest that it may have been used by pilgrims visiting Jerusalem before they walked up to the Temple. This is supported by the discovery of a massive first century street consisting of steps that led up to the temple complex, providing easy access from the pool and the southeastern part of the city. Artefact discoveries at the pool, such as a bell that could have been part of the priestly attire and an engraving of a menorah, also indicate ritual use of the pool. This accords with records in the Talmud about a tradition performed during the Feast of Tabernacles in which a priest would take a golden vessel to the Pool of Siloam, fill it with water, bring it back to the temple, and then pour the water on one of the sides of the altar as a libation offering while another priest poured a wine libation offering on the other side (Sukk 4.9). It is also possible that the Pool of Siloam was turned into the Nymphaeum, or Shrine of the Four Nymphs, by Emperor Hadrian during the building of Aelia Capitolina (Chronicon Paschale, 119). While this would be consistent with the pattern of Hadrian building pagan temples and shrines over sites associated with Christianity, the numismatic and ceramic evidence indicates that the pool was not in use from 70 AD until its recent rediscovery. However, remains from the second century AD were discovered at the upper pool. Perhaps the Nymphaeum covered the upper pool section of the Pool of Siloam, while the lower was unknown at that point in time, and that is why the Byzantines later built a church on that location rather than at the “lost” lower pool. 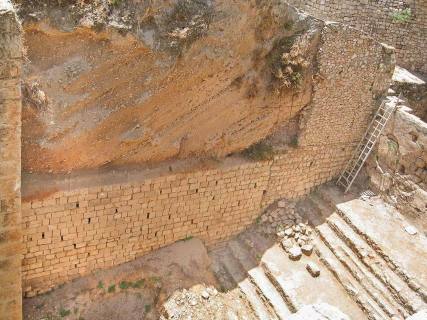 Therefore, it appears that the Pools of Bethesda and Siloam, situated to the north and the south of the Temple, were built or redesigned at the time of Herod the Great to be used by the general population as ritual purification baths for Judaism before going on to the Temple. However, Jesus utilised these places of religious ritual to teach lessons about His identity and mission through miraculous works. Clearly the sites of the Pool of Bethesda and the Pool of Siloam were no invention of the Gospel writers, and were historical sites of the first century at the time of Jesus. And clearly the stories of the Gospels—illustrating the divinity of Christ—as demonstrated by the miracles, were of such strength that they required suppression, which resulted in the construction of pagan shrines above them. However, is there an account outside of the Gospels that records Jesus performing miracles? The Gospels describe miracles with words such as dunamis (power), semion (sign) and teras (wonder). The English word “miracle” comes from the Latin word miraculum (wonder) of the Roman period, which came to be used in early Christian literature to describe supernatural acts of God. Due to the inclusion of these works of power, sceptics and higher critics have often therefore portrayed the Gospel accounts as merely unhistorical religious propaganda. Yet, multiple writers from the ancient world, even those who opposed Jesus, acknowledged that He performed miracles. The mindset of the times did not discount supernatural acts as fairy­tale or myth as we are want to do today, as records from antiquity demonstrate familiarity with these phenomena. A philosopher, pagan and opponent of Christianity named Celsus, who lived in the second century ad, wrote a critical work attacking Christianity and Jesus, to which the Church Father Origen responded in defence. In one passage, Celsus claimed that while Jesus was in Egypt, He somehow acquired miraculous powers, which He later used in Judea to demonstrate that He was a god (Celsus, The True Word). Therefore, Celsus confirms that knowledge of Jesus and His miracles had spread throughout the Roman Empire, even to pagan sceptics of Jesus, and he acknowledged that Jesus performed supernatural, miraculous works, but attributed them to Egyptian magic. Around the same time, a former Roman pagan turned Christian scholar, Justin Martyr, wrote a letter to Emperor Antoninus Pius (about AD 150), in which he mentions the miracles of Jesus. Pius succeeded Emperor Hadrian, who attempted to replace many Christian sites with pagan shrines and temples. But although Pius was a traditional Roman polytheist, he seems to have been an emperor who was not oppressive of Christians (Cassius Dio, Roman History). In his letter, Justin used the opportunity to argue the legitimacy of Christianity to the emperor by presenting evidence and referring him to accessible Roman records about the life of Jesus that were recorded during the time of Pontius Pilate in Judea. In one section of this letter, Justin informs the emperor that if he would read the Roman records that he referred to as the Acts of Pontius Pilate, he would see that these writings also attributed various miracles to Jesus (Justin Martyr, Letter to Emperor Antoninus Pius). It seems that each Roman prefect or procurator kept records about major events that occurred in the provinces they governed. Those of Pontius Pilate in Judea Province apparently included information about a certain Jesus and His miracles, and these records were still accessible to the Roman government. The Mishneh, a component of the Talmud, which was compiled around AD 200 but contains historical information from the previous centuries, appears to preserve a few events associated with Jesus that were likely recorded in the first century ad. One passage in particular mentions how Jesus allegedly practised sorcery or magic and led Israel astray, which is an obvious reference to types of miraculous or supernatural works that Jesus performed (Sanhedrin 43a; Sanhedrin 107b; Sotah 47a). The claim in the Mishneh that the powers of Jesus were supernatural, but the accusation that they were derived from an evil source rather than God, is directly paralleled in the claims of the Pharisees recorded in the Gospels (see Matthew 9:20–35, 12:22–29), a rationalisation to deny Jesus’ true identity, yet a clear acknowledgement of His miracles nevertheless. Finally, Josephus, a native of Judea turned official Roman historian, writing in the late first century ad, appears to refer to Jesus performing miracles. In a short passage summarising the life of Jesus, the historian wrote that Jesus did works described as incredible, paradoxical or contrary to expectation (Josephus, Antiquities, 18.63). These “incredible” works are consistent with the word usage and description of supernatural or miraculous works in other Greek language sources, suggesting that Josephus was also aware of and made reference to the many miracles of Jesus (2 Maccabees 3:30; LXX Deuteronomy 28:59). People in and near the time of Jesus did not deny that He performed supernatural acts, although they had the opportunity. Rather, four separate sources from a variety of viewpoints in antiquity, dating back to the first and second centuries—Celsus, Justin, Josephus and the Mishneh—claim that Jesus performed miraculous works. Therefore, the accounts about Jesus at the pools of Bethesda and Siloam in the Gospel of John are consistent with both the archaeological and historical record, and should be regarded as historical accounts rather than religious propaganda or myth.